After oohing and aahing over Isaac Salazar’s book sculptures earlier this week, I started thinking about the various things I’ve done with old books, besides read, collect, and generally adore them. Mostly, I’ve used old books to make new ones, like the journals above, made from miniature Shakespeare collections. The books were in bad shape when I got them. The bindings were broken and most of the pages had fallen out, so I was happy to bring them back to life. I used the few pages that were left to make the papier-mâché bowl. One Christmas, when I was feeling creative and Hon was feeling industrious, we made this fireplace for the bookstore I was managing. The fireplace was even featured in the New Yorker’s Book Bench blog (she said proudly). 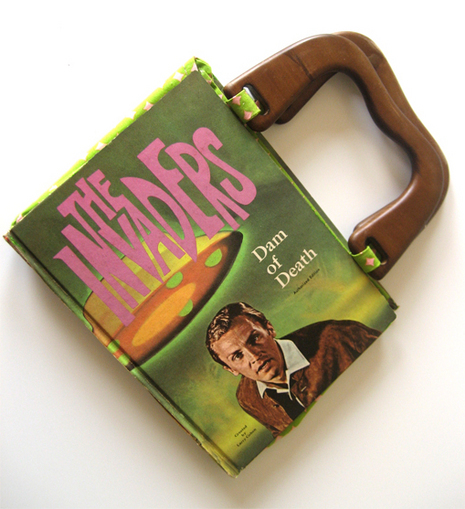 With a little ingenuity, there are hundreds of things that can be made (re)using books. This purse by curbly.com is an example, and I’ll be featuring more in future posts tagged “Once a Book.” If you’ve done any book re-use projects, I’d love to hear about them. As a book lover, I want need one of these purses, but I can’t even sew a button, so it’s not likely I’ll be making one soon. For those of you who can sew, here’s the tutorial from curbly. Resources: curbly.com, The Daily Post.